We have to give JVC props for taking a huge step forward in home video, leaping from 2D to 3D with the GS-TD1. You’ve probably heard so much about 3D that you’re red-green-blue in the face, especially with the introduction of Nintendo’s 3DS and 3D HDTV bubbling along in the background. Getting lost in the hype is JVC’s first Full HD 3D camcorder that’s loaded with 64GB of flash memory and is light years ahead of low-cost 3D movie makers currently available (think Sony Bloggie 3D). Now let’s determine if the GS-TD1 is worth its hefty list price. If you want to impress your friends with a gadget that looks like it beamed down from the “V” mothership with lovely Anna, the black-bodied, silver-accented Everio GS-TD1 is it. In order to accommodate two large lenses with enough separation to create 3D depth, the TD1 is much wider and unusual looking than any other camcorder on the market. When the $1,500 Sony HDR-TD10 arrives with its pair of large lenses in April, there will be company in this category but right now JVC stands alone. It measures 4.1 x 2.7 x 7.4 (WHD, in inches) and tips the scales at 1.4 pounds with the supplied battery. It’s big, heavy and wide; forget about simple one-handed shooting with this one. Since it’s a 3D camcorder, the most obvious feature is the f/1.2 Twin HD GT lenses on the front which looks a little like Wall-E, the animated Pixar robot. When shooting 3D, it’s a 5x optical zoom but if you switch to 2D, it’s a more powerful 10x. To the left and right of the lenses are large mics. JVC incorporated Biphonic technology for 3D sound and we’ll let you know shortly if it delivered. On the top is a cold accessory shoe, wide/tele toggle switch and a snapshot button for stills (yes, you can take 2.9-megapixel 3D and 2D photos). On the right is a comfortable Velcro strap, a switch for the manual lens cover, an input for optional mics and a door that covers the cavernous battery compartment. 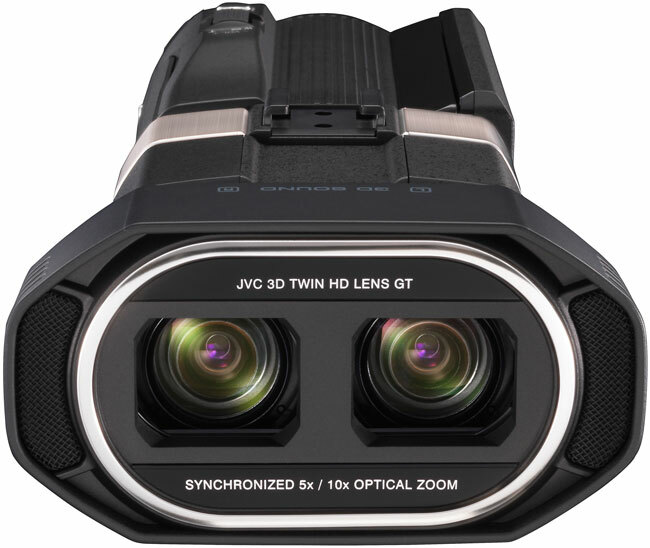 The supplied battery–which is rated around 1 hour for continuous 3D recording–gets lost in there and JVC offers an optional larger, longer-lasting battery. One of the GS-TD1’s coolest features is the swing-out LCD on the left-hand side. Not only is it a 3.5-inch touchscreen rated 920K pixels but this auto-stereoscopic display lets you check out your 3D creations without glasses just like the FujiFilm W3. Cool. Another plus is the Auto Parallax adjustment. You just tap an icon on the top left and the camcorder does the work for you and it does a good job. Manual screen adjustment is also available if you’re not totally happy with the results. One squawk—the icon is a bit small and inscrutable so a quick peek at the Basic User Guide was required. As a matter of fact, some other icons were bit perplexing but we guess that’s what owner’s manuals are for. You’ll do almost all of your tweaks via the touchscreen so there are a minimal amount of buttons on the GS-TD1. Thankfully, the screen reacts quickly to fingernail taps and swipes. Opposite the LCD on the body are compartments for SDXC cards, another for USB and A/V outs, a speaker and on/off button. On the back is a large silver button labeled 3D and it’s surrounded by five smaller ones: Adjustment, Info, User, Movie/Still and Manual/Auto. Adjustment takes you to the tweaks available in Manual mode (a scroll wheel at the bottom left makes the changes). Info shows the amount of recording time and battery life you have left while User activates your presets. Movie/Still lets you quickly jump between modes and Manual/Auto goes from point-and-record Intelligent Auto to Manual which has a wide range of options (focus, brightness, white balance and so on). The record button is on the far right and a headphone jack is above it. You’ll also find a compartment for mini HDMI out and DC-in for the AC adapter. 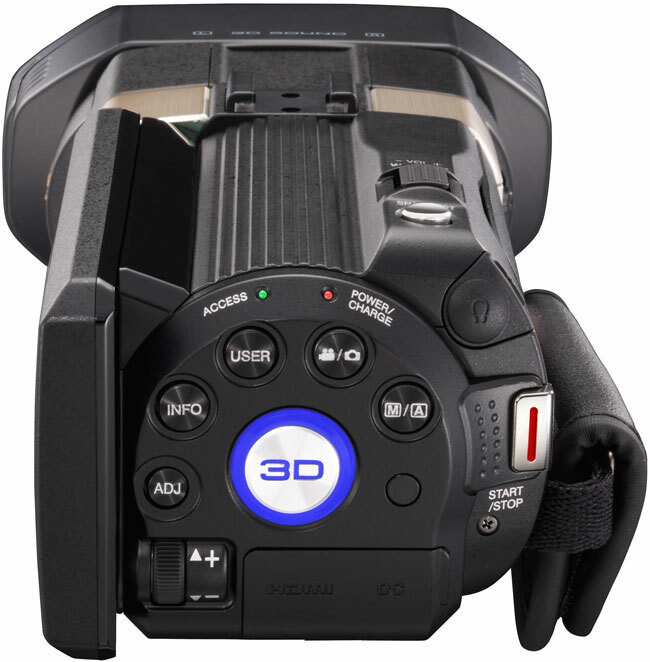 The big 3D button with its blue backlighting naturally lets you switch between 3D and 2D recording. You’ll also find a tripod mount on bottom of the Made In Malaysia camcorder. The camcorder, AC adapter, rechargeable battery, remote, USB and A/V cables as well as mini HDMI. You also get a fold-out Easy Start Guide, a 36-page Basic User Guide booklet in English. The supplied CD-ROM has Everio MediaBrowser 3D software and a link to download the full 146-page manual as a PDF.